Babywearing promotes safe, thriving babies and empowers parents to confidently bond with their kids. It also provides a strong foundation for shared experiences between baby and parents from day one. Thankfully it is becoming a more noticeable trend, and there are many opportunities for parents to find the right product to meet their babywearing needs. As a dad and a babywearing advocate, I want to share my experience with other dads who are considering babywearing. The bottom line - do it. It makes sharing daily activities with your baby possible, time together more enjoyable, and as a result you’ll connect more with your child. In 2009, my wife, Keri and I traveled to Burkina Faso, Africa, and observed babywearing as a normal way of life. Babies rest securely on their caregivers’ backs while the babywearers go about their normal daily activities. I was intrigued by how content and secure the babies were. In Burkina Faso, babywearing is rooted in the culture, and not just a matter of convenience. We were surprised by the stark contrast to how babies are typically transported in the United States, where car seats and strollers remain the primary medium for families on the go. While strollers and car seats are certainly necessary, they had taken the place of babywearing for so many families we knew. The way babies were carried in Burkina wasn’t going to work for the average American family, so we were inspired to simplify babywearing and allow our friends to also make it a part of daily life. Ironically, this was before Keri and I had even started our own family. Even so, we knew that if we could create a babywearing solution that was safe, easy to use and stylish, we could launch a movement. From our passion for babywearing, our company, Lalabu, was born. Today, we offer simple babywearing solutions for both mom and dad through our Soothe Shirt and more recent Dad Shirt. The positive effects of babywearing can completely change life with a newborn and boost your confidence as a parent. Our desire is to make babywearing convenient and accessible for everyone, especially for new fathers wanting increased involvement in their newborns’ lives. Here are a few reasons why babywearing isn't just for moms. Babywearing allows you to enjoy time with your baby from day one. 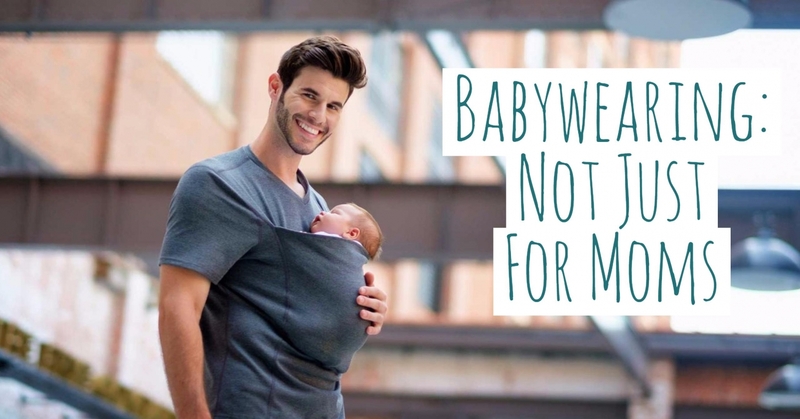 Sometimes it can be hard for dads to find their place with a newborn in the early days, but babywearing allows you to bring your baby into your daily rhythms. With every shared experience, your relationship is growing. My favorite part of babywearing is the foundation it has provided for my relationships with both of my children, which I attribute to shared experiences during the newborn season. When your baby is close to your body, he or she experiences a specific closeness to you, learning your body’s cues. Your baby picks up on your voice inflections, your body language and your facial expressions. This closeness allows for increased development within that critical season of your baby’s life. Babywearing provides a mechanism for dad to step in and be a hero to mom and baby on tough newborn days. The first ninety days after birth are considered the fourth trimester, and babies are still acclimating to the new world around them. Mom is dedicating a lot of time and energy to breastfeeding and dad can wear baby on an adventure between feedings so she can get some rest. When upset, babywearing provides a soothing security that we can use to calm our children. It has shaped the way I support my wife, allowing me to truly serve as her teammate every step of the way. In the beginning, I admit I was a bit intimidated by babywearing; but after experiencing it for myself, I truly believe it’s redefined the way I parent my children. It has laid a foundation of togetherness and pursuing shared experiences that has been irreplaceable. Babywearing has changed my life and my family for the better. I feel confident it will do the same for you. Together we can normalize babywearing for dads, for the sake of parents and our kids. Brian Fosse is co-founder of Lalabu, a simple babywearing brand. He resides in Atlanta, Ga., with his wife and two children (soon to be three!). To learn more about Lalabu or the Simple Babywearing Movement, visit lalabu.com. Instagram @lalabubaby.